To gaze is to think. 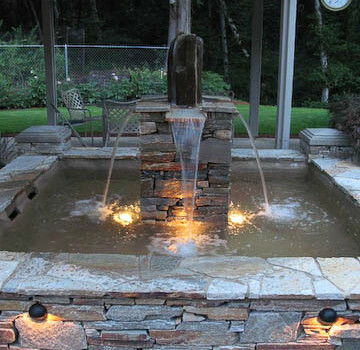 Outdoor lighting creates magic and drama to your yard. Lighting highlights focal points, showcases key elements such as waterscapes and hardscapes, lights pathways, and can set the mood for any occasion. Nightscaping creates a warm and inviting ambiance, capturing magic in your garden. Whether you want to brighten pathways and garden landscape areas, or refresh the look of your home to outdoor lighting, creating and ideal nighttime setting requires knowledge and a creative touch. Understanding the different usages between spotlighting and spread lighting can be the difference between having a lit yard or an elegant and romantic evening landscape. We have experience in lighting techniques that enhance structural elements, giving them a dramatic role in your nighttime landscape. Recessing lights in step risers provides safety for stairways, while floodlights and accent lights adds dramatic vertical light into branches of trees and shrubs, or spotlights areas such as a favorite arbor, hot tub or waterfall. Do­min­ion Land­scape is a land­scape de­sign and construction company that is privileged to share our love of the craft of landscaping with our clients. We are a company ex­cited to bring the best of land­scape ideas, vi­sion and quality of work­man­ship to one place… Yours! Do­min­ion Land­scape is de­voted to work­ing with our clients in the creation of their own custom land­scape, from residential to small commercial jobs. We spe­cial­ize in dis­cov­er­ing el­e­ment that you would like to see in your land­scape, from sim­ple to com­plex. Then we con­struct them in the way most suited to your lifestyle and need. Do­min­ion Land­scape is proud to serve the greater Eu­gene/Spring­field metro area, with clients served from Cor­val­lis to Creswell and Oakridge to Veneta. We are hon­ored to have been able to help our clients make their vi­sion a re­al­ity, and look for­ward to the new land­scapes to be cre­ated and clients to serve.